What types of collars does a professional dog trainer use? What Type of Collars Do You Use as a Professional Dog Trainer? I am frequently asked what type of collars I use as a professional dog trainer. Sometimes this is because people want to use the correct type of collar and sometimes they ask because they have beliefs around the ethics of choke and shock collars. I am glad I am asked because you must trust your dog trainer and their methods. Personally I have owned over two dozen dogs, and have trained hundreds professionally. I am a true pet lover and would never do anything to a dog that I wouldn’t do to myself. I believe that should be a standard expection for a professional dog trainer, but sadly I see some dog training focused on results at any cost. I simply don’t train that way. How do I train dogs? I train dogs using collars and leashes. I don’t use harnesses because they are designed for pulling and tracking. The harness is designed to go across the strongest part of the dog, which encourages pulling- a habit I am usually called in to stop the dog from doing. There are harnesses that cut into a dog’s mid-section or into his legs to get him to stop doing something, such as pulling or jumping, but to me, that seems harmful and can be addressed more humanely. The kind of collar I use depends on the severity of behavior problems your dog is exhibiting. I usually use a collar known as a martingale collar. A martingale is a type of dog collar that provides more control over the animal without the choking effect of a slip collar, commonly known as a choke chain. 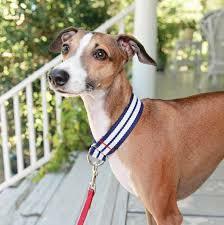 Martingale dog collars are also known as greyhound, whippet, or humane choke collars. The martingale dog collar was designed for sighthounds because their necks are larger than their heads and they can often slip out of buckle collars. These collars have gained popularity among other breed owners in the recent past with many trainers now recommending them instead of choke chains or buckle collars. A martingale collar is made with two loops. The larger loop is slipped onto the dog’s neck and a lead is then clipped to the smaller loop. When the dog tries to pull, the tension on the lead pulls the small loop taut, which makes the large loop smaller and tighter on the neck, thus preventing escape. Properly fitted, the collar will be comfortably loose when not in use. There is a time and place for other types of collars, yet I never do anything painful or unethical to you or your pet. As the situation dictates, we will talk about the methods I suggest and why. With proper use, training collars and remote collars (with the vibration function) are great correction tools that will not hurt your pet. If you are looking for an ethical, kind and effective professional dog trainer in Colorado Springs, please contact me today to see if we are a good fit for working together. Achieving balance between humans and their canine counterparts through a pack-oriented philosophy.